Manchester United claimed a 1-0 win over Liverpool at Anfield on Sunday afternoon, with Wayne Rooney scoring the winning goal. While the England captain deservedly took the plaudits as his decisive contribution sealed all three points, the visitors owed plenty to David de Gea. The Spaniard had a huge impact on the game with a number of top saves to deny the likes of Emre Can. Speculation suggests that Real Madrid will make another move for him, but on the basis of this performance, United can’t afford to lose him. Forced off with an injury in the first half after making a bright start to the game. Louis van Gaal will hope that the issue isn’t serious. 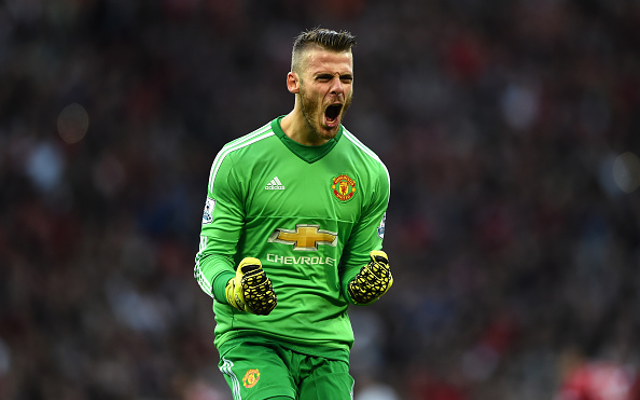 The towering defender will be delighted with keeping a clean sheet even though he had De Gea to thank for it. Did well to cope with Liverpool’s threat both aerial and on the ground throughout the game. Similarly to Smalling, the Dutchman produced a solid performance while helping United build from the back and set them off in attack. An energetic performance from the Italian who defended well, and was always a willing runner. Showed his versatility after being switched to the right following Young’s injury. Not the most influential of performances from the former Southampton star, but did well enough to give United a presence in midfield and helped them establish a foothold in the game. Fortunate not to be sent off in the first half after his altercation with Lucas Leiva, was a constant menace for Liverpool with his physicality and almost broke the deadlock with his header crashing off the crossbar before Wayne Rooney applied the finishing touch. The Frenchman’s trickery and pace was a real issue for Nathaniel Clyne, and while there wasn’t always an end product, he will certainly have been pleased with his contribution in ensuring United remained an attacking threat. The United supporters were disappointed to see the playmaker come off in the closing stages of the game, but it wasn’t one of the Spaniard’s better games as he suffered in an overall scrappy encounter. Wasn’t able to follow up his impressive display at Newcastle United, and will hope to do better in the coming weeks to secure his place in the starting XI. After enduring such a dismal goalscoring drought earlier in the season, Rooney showed his composure and clinical edge hasn’t disappeared as he latched on to the rebound from Fellaini’s header to smash home the only goal of the game to secure all three points for his side. The youngster still lacks consistency when in possession, but did well as he came on to fill in for Young at left-back. Did well after coming on to keep United ticking over and pushing forward in search of a winner, and made an important contribution in the build-up to the goal. The Dutchman didn’t particularly do much to suggest that a return to the starting lineup is in the offing.